Posted on April 13, 2009 at 9:21 am. Spring is “officially” here but there is still a lot of snow at the skatepark. We’re planning to clean it up so that we’ll be able to skate as soon as possible. Come out and join us on April 18th when we shovel, ice-chop, sweep, mop, and do what it takes to get Mills back into skateable condition. There will be some give-aways from The Source, Element Skateboards, and C1RCA. 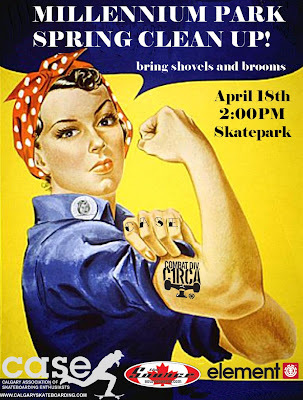 Check the poster for details and bring your own shovels and brooms!